The company Heartrunner delivers a medically approved and scientifically evaluated system- SMSlivräddare – to help save lives in cases of sudden cardiac arrest. The system is designed to recruit volunteers trained in cardiopulmonary resuscitation (CPR) and by using a sophisticated location service technology to identify volunteers close to a cardiac arrest and alert and guide them to the victim for lifesaving attempts, before the ambulance arrives. The system uses a mobile application for mobile phones and it is currently compatible with iOS and Android platforms. Heartrunner is a complete system that integrates several independent parts, including integration to emergency dispatch centres and map functions for Apple and Google products with separate certificates and licenses. A mobile application reports location and user data and compiles them into a smart coupling centre that calculates positions based on a larger database of volunteer lifesavers. Heartrunner project managers are responsible for technical installation of the system and start-up of the service. Together with the customer, project managers plan start-up meetings to ensure an effective and well-functioning installation process and use of the lifesaver system. The application is developed and owned by Heartrunner Sweden AB. To maintain the highest possible quality of service the company´s developers troubleshoots, bug fixes, and continuously upgrades the application whenever possible. Heartrunner ensures that the mobile application follows all licensing, rules and regulations required for the application to be compatible for download onto Apple and Google platforms. Likewise, Heartrunner coordinates optimal functionality in relation with operating system (OS) updates and changes to user terms and agreements. Heartrunner takes full responsibility for its service and support agreement and ensures a fully functional chain of alarm between dispatch centres and the positioning service as well as the alert system year round. In order to alert volunteers to cardiac arrest the positioning system and the SMS lifesaver database has access to SMS lifesavers’ mobile telephones. Due to the applications dependence on respective platforms OS and in order to keep the app functional, continuous testing and upgrades of the app is performed when OS updates is carried out. Heartrunner Sweden strives to provide a stable service and malfunctions are handled centrally at our service centre. Procedures for reporting errors and malfunctions are an important part of the service agreement. The support section is included in the service agreement and customers can be assured that the Lifesaver service functions according to the agreement. Support for the systems functionality at the dispatch centre and for the mobile application is managed centrally at our service centre. Information about reporting malfunctions is included in the support agreement in order for service to be uninterrupted or even improved. Heartrunner stores and handles all data concerning SMS lifesavers and the alerting of lifesavers. Supplier partnerships with local emergency dispatch services, such as SOS Alarm AB and technical supplier UMS, are handled internally at our service centre. The support agreement includes service support available on weekdays between 8-18 (Monday-Friday) – with service guaranteed to be completed the following weekday. More intensive and flexible support capacity is available for arrangement if so desired. The number of available volunteer lifesavers will be a critically important factor in the outcome of patients affected by cardiac arrest. Today in Sweden approximately 1 in 10 victims of cardiac arrest survive. Far more of those lives could be saved if lifesaving action as CPR, is taken immediately or as soon as possible. Previous evaluations have demonstrated that a ratio of 300 lifesavers per 100,000 residents is the minimum threshold for a successful SMS lifesaver system. Heartrunner strives to withhold that level within the framework of this agreement. Any lifesavers that we take on over and above the aforementioned amount in this agreement incur a service and maintenance fee per lifesaver per year. The responsibility for all volunteer lifesavers in Sweden is taken on by the central organisation. This responsibility includes central and local project management, registration, information and communication with volunteers and update of the SMSlifesaver database. Heartrunner Sweden is responsible for the overall recruitment of volunteer SMSlifesavers on a national and regional level and develops all key marketing and PR strategies and activities. Heartrunner Sweden ensures contact with the local dispatch centre in the regions as well as on a national level and also with ambulance, fire department, police and other organisations involved in the chain of alarm in regions where the system is installed. HEartrunner Sweden facilitates and maintains an infrastructure for volunteers to report their actions in a way that allows scientific evaluation of the system effectiveness. And the company also ensures that data concerning volunteer activities in lifesaving attempts, to a certain level, is available for evaluation in the regions where the system is installed. 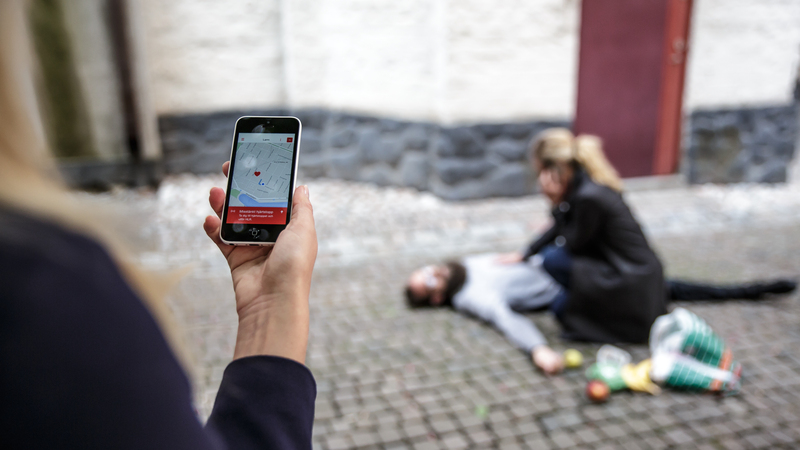 In addition to the basic feature of the system, guiding volunteers to perform early CPR, the Heartrunner Lifesaver system can alert volunteers and guide them to nearby AEDs. This supplementary service can be included in the system and displays AEDs in the surroundings directly on a map in the mobile application. This supplementary service is integrated with the Swedish AED Registry and it relies on their validation of the AEDs in each county. This service follows procedures for administering, returning and performing maintenance on AEDs and each AED is validated to ensure that it is in place in case of a cardiac arrest in the vicinity, that it is functional and the user confirms that an SMSlifesavers can use the AED in case of an alarm. Heartrunner Sweden AB is owned by private stakeholders and investors. Karolinska Institutet Innovation AB and Unified Messaging Systems AS are partners. If you have further questions on how Heartrunner Sweden AB can support the strive for increased survival after cardiac arrest in your community, please contact David Fredman, operations manager.